January 27, 2012, 1:25 PM · Mahler's Symphony No. 3 is longest of all the Mahler symphonies; on Tuesday night, the six-movement symphony lasted nearly two hours (the first movement alone was 45 minutes). It is scored for a huge orchestra and demands much of the brass section, with extended solos for trombone and French horn. It also requires a well-trained children's choir, as well as an adult female choir and a mezzo-soprano soloist. These considerable demands may be one of the reasons why it played less often than the other symphonies; or why sometimes its movements are played on their own. Certainly I've not heard this piece as much as I've heard the other Mahler symphonies. I do believe American union musicians (I'm one of them) would have to seek an exception from their rules in order to stay on stage for two hours straight. On Tuesday, the Simón Bolívar Symphony Orchestra of Venezuela performed this symphony, along with members of the Los Angeles Master's Chorale and mezzo-soprano Christianne Stotijn. My 11-year-old son was among 40 (epically patient) children from the Los Angeles Children's Chorus, directed by Anne Tomlinson, singing the "Bimm Bamm" bell part in the fifth movement -- which they performed with clarity, pitch-perfection and professionalism (if I do say so myself). Seriously, I was thrilled that these children from my community in Los Angeles (another young chorister was one of my longtime violin students) were sharing the stage with such fine young musicians from another continent, and that their efforts together, under Gustavo Dudamel, were making this extraordinary symphony come alive for this moment in time. Another interesting revelation about his symphony came beforehand, with a pre-concert talk by British author Norman Lebrecht, whose sociological take on Mahler is expressed in his book Why Mahler? He promised the packed audience that he would not talk about Mahler 3, but instead he would talk about racism, social conflict, relationship breakdown, alienation, depression and premonitions of war -- because Mahler 3 holds all of that in its opening bars. Lebrecht drew a line between the First Symphony by Brahms, a composer worshiped in Germany as the heir apparent to Beethoven, to the Third Symphony by Mahler, a German Jew barred from so much of normal life because of his religion. Lebrecht said that German audiences often don't hear the connection, and at first I didn't, either. But listen for just a few seconds to each: Brahms 1, last movement (it's all cued to the right part); and then the beginning of Mahler 3. Both composers, Lebrecht said, were using a nationalist student song, which translates, "I have given myself, heart and hand, to thee … my German fatherland." While Brahms sets it in loving triumph, Mahler makes it a menace. It's there, and once I heard that resemblance, I continued to hear it all night as the symphony unfolded. Indeed, the symphony began with that rather ominous horn call, which quiets into a low, toneless drumbeat -- a heartbeat of dread, not quite steady. A tremolo in the strings sounded downright tremulous -- the masses shaking in their boots while the trumpets sounded the call. It's all pretty dark and unsettled. 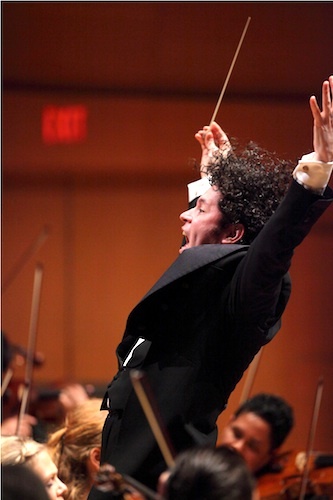 Last week, LA Phil Concertmaster Martin Chalifour predicted that Dudamel just might conduct every Mahler symphony without a score, and so far he has been correct: on Tuesday Dudamel conducted Mahler 3 without a score. Principal trombonist (Pedro Carrero?) carried his own in several extended solos, which turned in many directions musically and required quite a range of pitch. He captured the lament and nailed the very low notes. The celli and bass also showed their stuff as a section, with great passagework. The ending of this very long movement was simply too huge for the audience to resist applauding, so there was much clapping, then a short break. Both choirs, neither which had yet sung, stood for a 8:45 p.m. stretch while the orchestra tuned. The second movement, originally conceived as "what the flowers in the meadow tell me," sounds like a soupy movie score at times, and at other times a roadrunner version of Mahler's greatest hits (for example, we get a preview here of the last movement of Mahler 4, in greatly condensed and accelerated form). Dudamel, always mesmerizing, nimbly negotiated this rather sunny collage of tempos and musical ideas. "The creatures in the forest" were the original subjects for the third movement, which has a familiar melody, woven with the deferred-beat effect of the slurs. A sweet little melody grows unwieldy, grows enormous -- then it jumps back into its original form. Or, sometimes it jumps out of the closet as a monster of itself. Then -- where is that horn coming from? A posthorn solo is played off stage -- a powerful disembodied effect. Again, the program was not completely clear about who played this major solo, and certainly this person deserved to be credited. It was full of beauty and purity -- and just a few minor falters. In fact, a number of wobbles and falters in the horns throughout the night made me wonder if it's a bit of a strain to perform Mahler 2, then 3, then 5, all within the course of five days. There's a difference between a fault caused by incompetence and one caused by exhaustion, and I was certainly not hearing incompetence. Mezzo-soprano Christianne Stotijn was the star for the fourth movement, which was about the night; and then the choirs arose for the fifth movement, with the children imitating bells under a women's choir. I wanted this movement to last longer! The sixth movement moves in a more straightforward way, like a pool of shifting light; all forces unite in a slow-motion climax -- and then the same thing happens again. It ends and ends and ends! And then finally, it ends. January 29, 2012 at 08:30 AM · Extremely interesting comments by Norman Lebrecht..I'd go even further and point the similarities between Brahms 1st, Mahler's third and Beethoven's ninth symphonies!! BTW, North and South America belong to the same continent, don't they? January 30, 2012 at 05:22 AM · Daniel, actually North America and South America are two separate continents, kind of like Europe and Africa. We don't much go for the Olympics definition of "the Americas," and it's not what we learn in school. If you look at a map, you can see how separate they are; I do believe they rest on different tectonic plates, and they are mostly in different hemispheres! Here's a good summation of the different thoughts on the matter. January 31, 2012 at 06:20 PM · I had no idea there were several theories on the actual number of continents!! So...in what continent would you localize central America?